EUGENE, Ore. – Ami Lakoju, a freshman on the UCSB men’s basketball team, had to be revived with a defibrillator after collapsing during Sunday night’s practice while in preparation for tonight’s basketball game at the University of Oregon. He was rushed by paramedics to River Bend Medical Center in Springfield where his condition had not been released yet by press time. UCSB officials said they were also unable to comment about Lakoju’s condition or the status of tonight’s 6 o’clock game against Oregon. Sources later reported, however, that he was alert and resting comfortably at the hospital, while being monitored overnight. The episode occurred at 7:40 p.m. while the Gauchos were nearing the end of their workout at Mathew Knight Arena on the Oregon campus. Lakoju, a 6-foot-8 and 265-pound center from Harlem, N.Y., had been having a strong and spirited workout, according to his coaches. He was standing along the end line, watching several of his teammates run through a drill, when he suddenly fell hard to the floor, with his head striking the court. Katie Susskind, who is completing only her first week as an athletic trainer at UCSB, rushed straight to his side to begin resuscitation procedures. Jason Levy, the team’s director of academic and internal affairs, summoned the arena’s facility manager, who immediately delivered the defibrillator. Lakoju received several jolts from the machine, restarting his heartbeat and his breathing within about 90 seconds. Paramedics arrived several minutes later after a 911 call was made by Bill Mahoney, UCSB’s associate athletic director for media relations. The Gaucho players, although visibly shaken by the situation, soon gathered together in a circle to pray while Lakoju was being attended to by the medical personnel. Head coach Bob Williams and several of his assistants gathered by Lakoju’s side, offering him words of encouragement. Lakoju was rushed to the hospital by ambulance, accompanied by coach Williams, after he began responding to the paramedics’ questions. 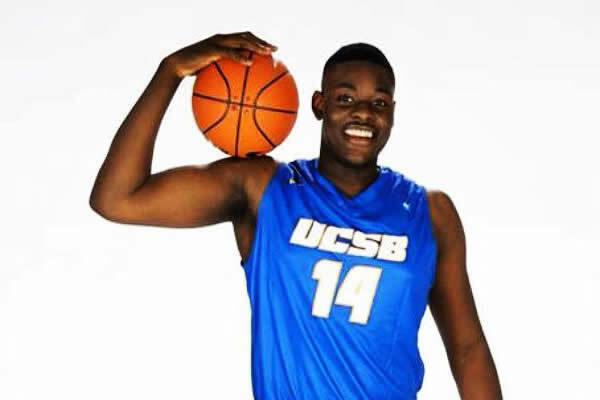 Lakoju, who turned 19 last month, was recruited last year as the eventual successor of UCSB’s star center, Alan Williams. He averaged 15 points, 11 rebounds and three blocked shots as a senior last year at St. Luke’s School in Connecticut. The Gauchos (5-5) were scheduled to play Oregon (8-3) of the Pac-12 Conference in a nonconference game tonight.